The ‘O’nly place for Beef ‘O’ Brady menu prices. Beef ‘O’ Brady is a US based restaurant chain that specializes in casual food menu items like burgers, pizza, buffalo wings and flatbreads. The restaurant was founded in 1985 in Brandon, Florida by Jim Mellody. Before Jim settled on the Beef ‘O’ Brady theme he experimented with various types, as what he was really looking for was a restaurant that was family friendly with no hard drinks. Since the restaurant was founded in 1985, it has expanded rapidly and can now be found in several states. Below are the latest Beef ‘O’ Brady’s menu prices. All Burgers are seasoned with a blend of Kosher salt and black pepper, served on our new toasted brioche bun with straight cut fries. Each cooked medium, medium well, or well done. Bleu Cheese, Ranch, Fat-Free Ranch, Honey Mustard, Caesar, Creamy Poblano, Balsamic Vinaigrette, 1000 Island, Italian, Oil & Vinegar. Served With Straight Cut Fries, Unless Otherwise Specifies. Served with straight cut fires of your choice of broccoli, celery sticks, creamy coleslaw, seasoned rice, mashed potatoes, pub chips, or mandarin oranges. Choose from milk, chocolate milk, juice or fountain drink. Each meal includes a treat. For children 12 years and younger, please. In 1998, Mellody sold most of his shares to Family Sports Concepts Inc. but maintained control in a few locations. Following the death of Mellody, his shares were bought out. As of 2011, the restaurant has more than 200 locations in the United States. Today Beef ‘O’ Brady offers a variety of treats on the menu such as the Whole Lotta Steak Nachos and Cheesy Bacon Pub Chips for the starters, Land, Sea & Air and Combo Appetizers. The ‘O’ Brady’s Entrees also includes Grilled Shrimp, The Dubliner and Trio Fajitas, and of course there is their famous Jumbo Wings, and Game Time Pizzas like Boom Goes the Dynamite, The Kitchen Sink, The Great White – with chicken and more. 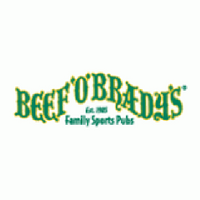 For more information about Beef ‘O’ Brady’s, visit their official website.